Chevrolet decided to enter the growing personal luxury market for 1970. To do so, Chevrolet introduced the Monte Carlo. 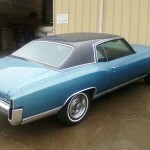 The Monte Carlo was was Chevrolet’s counterpart to the Pontiac Grand Prix, which had been introduced for 1969 model year. Both vehicles used General Motors G-body, which was also called the A-Body special. The Monte Carlo was a two-door coupe and marketed as a personal-luxury car. The Monte Carlo proved to be a success for Chevrolet and would outlive many of its competitors. 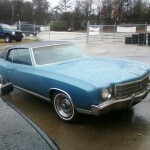 The Monte Carlo was styled after the contemporary Cadillac Eldorado and used much of the body and structure of the A-body Chevrolet Chevelle. Shared structure components included the firewall, windshield, decklid, and rear window. 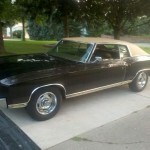 The Monte Carlo had a working name Concours and at some point, was planned for a formal coupe, sedan, and convertible. The 1970 Monte Carlo came with a standard powertrain of the 350 cubic inch engine, the Chevrolet’ “Turbo-Fire” small-block V8, and a two-barrel carburetor. The powertrain was rated at 250 horsepower. Front disc brakes were standard equipment. 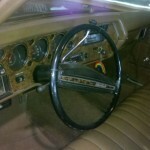 The dashboard was identical to the Chevelle except for some fake wood trim. The interior featured higher grade nylon or vinyl upholstery than the Chevelle and came with deep-twist carpeting. Optional equipment on the Monte Carlo included a two-speed Powerglide automatic transmission, a three-speed Turbo-Hydramatic, or a four-speed manual transmission; variable-ratio power steering; power windows; air conditioning; power seats; Rallye wheels; Strato bucket seats; center console and full instrumentation. Engine choices included the four-barrel carbureted Turbo-Fire 350 cubic inch small block V8, the Turbo-Fire 400 cubic inch V8 with a two-barrel carburetor, and the Turbo-Jet 402 cubic inch V8 with a four-barrel carburetor. 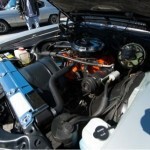 A Monte Carlo SS package included a 454 cubic inch engine with a four-barrel carburetor rated at 360 horsepower. The SS package included a heavy-duty suspension, wider tires, “SS 454″ badging, and an automatic load-leveling rear suspension. The Turbo-Hydramatic transmission, with a 3.31 rear axle, was a mandatory option with the SS package. The 1971 Monte Carlo saw only minimal changes. The SS model got new “European symbol knobs” and a four-spoke steering wheel became optional. A stand-up hood ornament was added. The small-block Turbo-Fire 400 two-barrel engine was dropped. This would be the last year for the SS 454 package after production of just 1,919 units, but the 454 cubic inch V8 engine would remain optional in Monte Carlos through 1975. 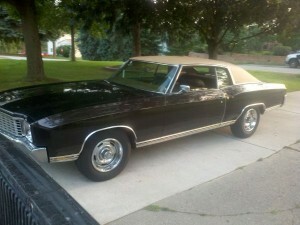 It was stated the SS option diluted the marketing effort of the Monte Carlo as a luxury vehicle. 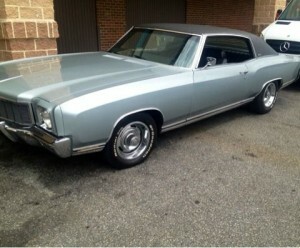 This would be the last year for the first generation Monte Carlo. 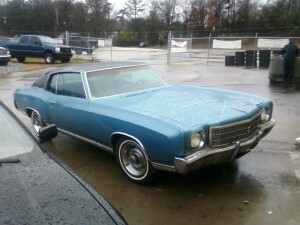 All GM A-bodies and G-bodies would be all new for 1973. Changes for 1972 included a Cadillac-like egg-crate grille similar to the 1971 Chevrolet Caprice and a metal rear trim molding. A Monte Carlo Custom option replaced the SS package, that included a special suspension and other items from the departed SS package. The Custom option was available with any Monte Carlo engine option. Badging for the Custom was similar to the Impala Custom. The four-speed manual transmission was discontinued from the option list as such on option was deemed not acceptable on a luxury car. Variable-ratio power steering became standard equipment for the first time. 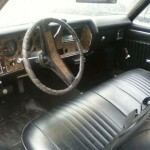 The interior trim was relatively unchanged other than the availability of all-vinyl upholstery with the standard bench seat in addition to the optional Strato bucket seats. For other Chevrolets, see our posts on the 1968-1970 Chevrolet Chevelle, 1963-1967 Chevrolet Corvette or the 1965-1970 Chevrolet Impala. 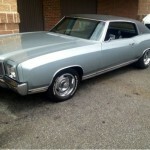 For other G-body cars, see our post on the 1969-1972 Pontiac Grand Prix or the 1970-1972 Oldsmobile Cutlass Supreme. To find or sell your own Classic Car, see the Classics For Sale listings. 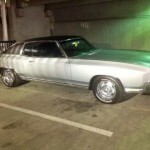 This entry was posted in Monte Carlo and tagged Caprice, Eldorado, Elite, Grand Prix, Impala. Bookmark the permalink.